Imagine tomorrow that there were no religious rules regulating you. You were no longer bound to act in a certain way and there was no punishment for doing anything. What crimes would you commit? Murder? Arson? Or would you just continue to live your life as you did today and yesterday? As our society becomes more modernized, a statement made by religious organizations is that it provides a morality for society, creating a clear category of right and wrong. The argument goes that without religion, there would be no moral compass and individuals would act in a brutish manner towards each other. There is statistical support for religion on behavior. If you are religious you are less likely to engage in destructive behaviors like drug abuse, criminal behavior, do better in school, and avoid infidelity. But does that mean that religion is necessary for morality? It is not worth arguing about the use of religion for avoiding dangerous behaviors and sanctioning others. Although if we stacked the number of good acts inspired by religion versus the evil acts that have been done under the guise of religion, it probably would rank religion as a greater justification for genocide, war, slavery, etc. than human rights. In fact, when looking at human rights issues, the more religious a country is the less respect there is for fellow human beings. The most religious countries in the world rank toward the bottom of the United Nations Human Rights Index and countries that are more secular have greater happiness and rights for the individual. 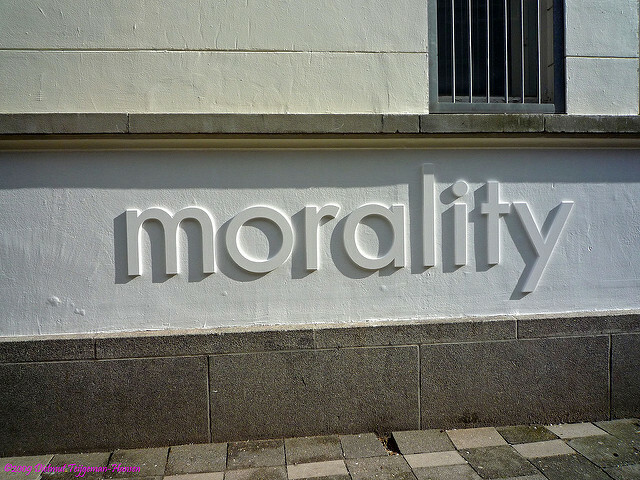 But does religion really create morality? To be moral is to do an act because it is the correct thing to do, not for an external reason. If people don’t go out and kill their neighbors for fear of eternal punishment that seems to be doing it because of the consequence of the action, rather than an innate belief in the action itself is good. The reverse is also true. If people do good acts because they know it will lead to an afterlife of bliss than again the consequence is what is determining the action. This is not to say that religion does not have morality. Many individuals and social movements have had religious organizations been at the vanguard of change. It does mean that a moral world can exist without religion. Therefore, instead of saying one morality trumps the other, both should be embraced.